If you have not already read the previous parts, I would highly recommend you start there. Especially the post about the AngularJS App-View contains vital information + prerequisites so you can try all this code directly in your DNN. To learn AngularJS you will have to get your hands dirty. So go ahead and install DNN with 2sxc as explained in this post and install this demo-App containing all the code explained here. This is a rough overview so you see the big picture, before we go into the details. AngularJS manages all modules, and will ensure that they are loaded in the right sequence - because each module will say what things it depends on - and Angular will manage that. In addition, any parameters with a known name (pre-registered or typically with the $) will automatically be provided by AngularJS. So simply by saying "this method needs $window" it will automatically receive $window. The code is mostly self explanatory. The one detail I would like to point out is the dependency declaration: at the end of the long statement you see a ["DemoFaqAppAdvanced"] which again tells Angular that it has to load that DemoFaqAppAdvanced before trying bootstrapping (loading) the app. Now that Angular loaded the controller (because of the dependency) and started the App with this, it will initiate the controller. Note the $attrs which we need to determine the ModuleId passed in the HTML-attribute data-moduleid. Again, it's automatically connected by Angular. 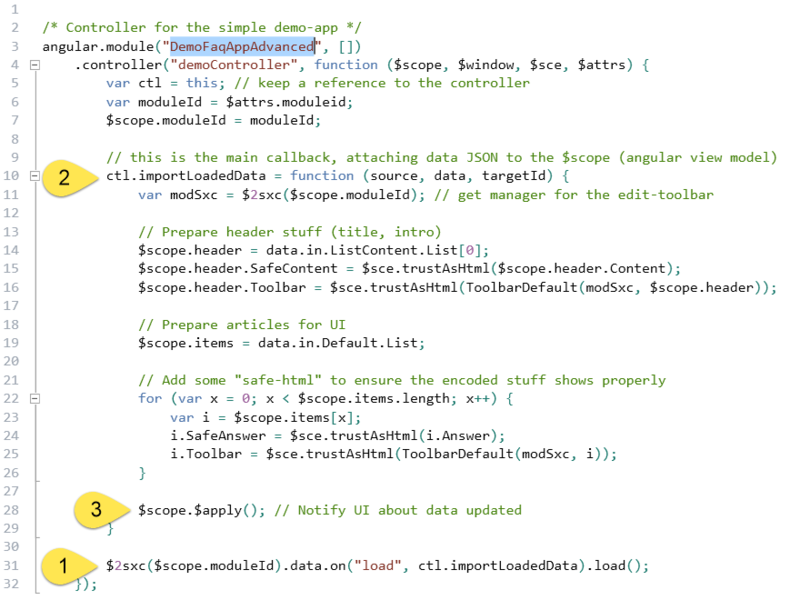 The controller then initializes the $scope (+/- the viewmodel) and then hands control back to AngularJS. Once the $scope is filled, it reports this by saying $scope.$apply() - this will tell AngularJS that something changed, and that data-binding would be a good idea sometime in the future. That's right: Databinding does not happen right then and there! This is a great feature in AngularJS. We used to work with knockoutJS which binds data automatically - this required us to write much longer code (using observables) and killed browser performance, because every change tried to rebuild the view - again requiring workarounds. Angular automatically detects binds after specific events like clicks and more, but won't auto-bind if data is added "secretly". Because of this we tell AngularJS that it should $apply again. 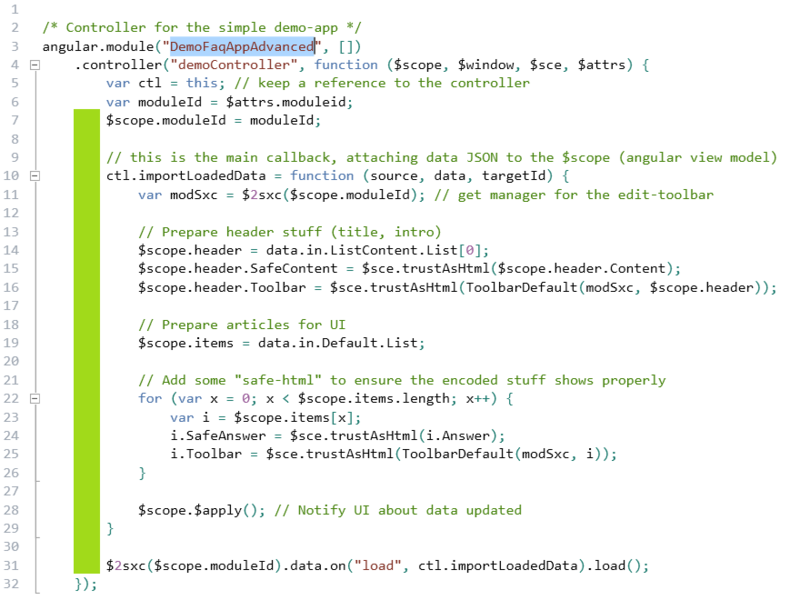 AngularJS does a lot for you behind the scenes, making it easier to develop according to best practices. 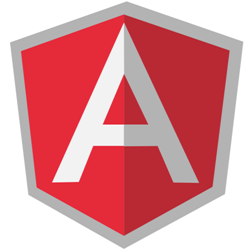 But you must understand what it does to leverage the power of AngularJS. I hope you love it as much as we do :). You must get your hands dirty! Reading this won't make you smarter if you don't try it yourself. Just use 30 minutes to download the App, make some adjustments (like adding fields or changing the JS-effects). That way you'll get smart really fast! Daniel, I really love your work and the power of angularjs. Could you also give examples of using OR best way of implementing angularjs in a dnn module development template, eg., christoc OR InspectorIT/DNN-Module-Template. How can we use angularjs in those templates. And what is the most effective way. I als hope that somebody can post (url) of a good example. And I hope that Jonathan Sheely give us some examples. Because the future of .net is so different than the current module-system in DNN, I have some difficulty providing a good example for those. Reason: In the near future (IMHO) there will be no more precompiled DLLs on the server, no more WebControls. So the future has open-sourced (literally: with source) WebAPIs (on-the-fly-compiled) which deliver the data to the AngularJS App. And all operations (like save, edit, etc.) will also be performed through such WebAPIs. We just finished this setup for 2sxc (V. 6.4.2 beta offers exactly this setup). Since we plan to go stable next week, I'll see if I can provide good examples for this. But it's not the classic DNN-Module like you've seen - it's more the way DNN-Modules will be built in DNN 8. Just to correct one minor mistake: there will be precompiled DLLs on the server - namely those of the "environment". So of course .net DLLs will exist and DNN will probably be fully precompiled. But the final layer of service - the custom stuff - will only be on-the-fly compiled. You can discover more about this if you research the new open-source .net on-the-fly compiler called Roslyn by Microsoft. I am currently working on an Angular module demo for DNNHero. I got a lot from your blog on this subject. One thing I am trying to determine is the best practice way of accessing DNN framework services from Angular. I have a working example using the $http module to call the WebAPI service from the controller. What I prefer would be to create an angular service or factory that handles the service calls for my controller. I just need to figure out the best way to pass the moduleID and moduleName into the service/factory instead of the controller. Then I can call the service/factory methods from my controller. Like you, I am trying to encourage developers to shift from webforms to MVC. Until we get to DNN7.5, developing a module with Angular/WebAPI services represents a step toward that transformation to remove dependencies on the webforms layer. The way I see it (but bear with me that I never programmed a service before since i'me more the consultant and can't spend as much time coding as i would like to...) the service is a singleton pattern. Meaning it could never "remember" the module IT at initialization, because otherwise all instances would have the same ModuleID. So I'm guessing the module-id would have to be handed in for every single request. So the module id must be per request.